The Waldenstrom’s Macroglobulinemia program at Dana Farber Cancer Institute (DFCI) was founded in 1999 by Dr. Steve Treon with the help of patients, caregivers and DFCI scientists in an effort to advance our understanding of the cause of WM, and to pursue novel therapies. 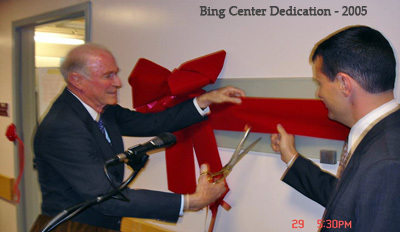 In 2005, the WM program was officially designated as the Bing Center for WM, in honor of Peter S. Bing M.D., former Chair and current Trustee of Stanford University. 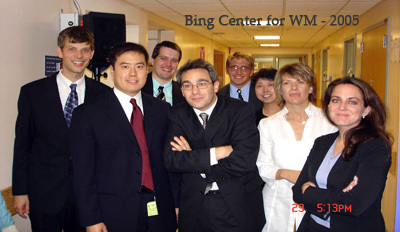 The Bing Center for WM cares for nearly 1,000 WM patients worldwide, including 300-400 new patients annually. Most patients seen in the WM clinic enter Institutional Review Board (IRB)-approved studies on the genetic basis, pathogenesis and treatment of WM. Using whole-genome sequencing, the Bing Center for WM was the first to clarify the genetic basis of WM by identifying MYD88 (L265P) as a highly recurring somatic mutation in 95% of WM patients (NEJM). This finding has permitted differentiation of WM from other B-cell malignancies that share overlapping characteristics, and was adopted in WHO and NCCN guidelines as a supportive diagnostic marker for WM. The Bing Center also developed a highly sensitive allele-specific polymerase chain reaction (AS-PCR) assay to identify MYD88 L265P in bone marrow and peripheral blood samples of WM patients. This assay also identified MYD88 L265P in samples from patients with immunoglobulin M (IgM) monoclonal gammopathy of undetermined significance (MGUS), a precursor condition to WM, thereby invoking an early oncogenic role for MYD88 L265P in WM pathogenesis. Other mutations, including copy number alterations that lead to loss of genes that can dampen MYD88 L265P signaling, were subsequently identified by the Bing Center and published as a plenary paper in the prestigious journal, Blood. The Bing Center for WM was also the first to report that Bruton’s tyrosine kinase (BTK) was a downstream target of MYD88 L265P mutation. This critical finding enabled a clinical trial to investigate the BTK inhibitor ibrutinib in previously treated WM patients, which showed an 91% overall response rate. Our combined scientific and clinical findings was the basis for the first-ever “breakthrough designation” for oncology fast-track drug approval, and the first-ever approval of a drug (ibrutinib) by the U.S. FDA and the European Medicines Agency (NEJM). This study also showed that the mutation status of MYD88 and CXCR4 (discussed below) impacted treatment response. In collaboration with the medicinal chemistry laboratory of Dr. Nathanael Gray at Harvard Medical School, our center is developing novel kinase inhibitors that interfere with other nodal points in MYD88 L265P signaling, including the SRC family member HCK that is upregulated and activated by mutated MYD88. Our combined efforts have identified several novel compounds that target previously known and unknown kinases in MYD88 L265P signaling, and a lead compound is being advanced for human studies. Another landmark finding by the Bing Center was identification of somatic WHIM-like mutations in CXCR4, a gene responsible for WM cell trafficking to bone marrow. We identified over 30 different types of CXCR4 mutations in WM patients, including nonsense and frameshift mutations, and were the first to report on their clinical impact. Our center found that WM patients with CXCR4 nonsense mutations were more likely to have aggressive disease features, including hyperviscosity crisis. The impact of MYD88 and CXCR4 mutations on the overall survival of WM patients was also first reported by us in a study identifying that risk of death was impacted not by CXCR4 mutation status but by the presence of wild-type MYD88, which increased risk of death ten-fold. Our center was also the first to elaborate on the activating nature of CXCR4 mutations in WM, and the association of CXCR4 mutations with chemotherapy resistance, including ibrutinib. These findings were subsequently confirmed in a prospective, multicenter clinical trial by the Bing Center, which showed lower response rates in patients with CXCR4 WHIM mutations that received ibrutinib. Our center was also the first to show that a CXCR4 antagonist could be used to sensitize CXCR4 mutated cells to ibrutinib, and a patent for CXCR4 mutation testing and use of CXCR4 antagonists to treat patients with CXCR4 WHIM mutations was issued for these discoveries. A clinical trial examining ibrutinib in combination with the CXCR4 antagonist plerixafor is being initiated with funding from a Leukemia and Lymphoma Society Translational Research Grant. Our center also made important contributions to the understanding of how the bone marrow microenvironment (where WM cells reside) supports expansion of WM cells. The Bing Center studies were first to recognize that bone marrow mast cells, which are increased in WM patients, contribute to the expansion of malignant cells. We elaborated on the molecular mechanisms responsible for mast-cell-induced growth of WM cells, which included the finding that WM cells secrete soluble CD27, a ligand that induces growth-enhancing cell surface molecules such as CD40L and APRIL on mast cells through the CD70 receptor. We showed that a CD70 blocking antibody inhibited the induction of these molecules by soluble CD27. 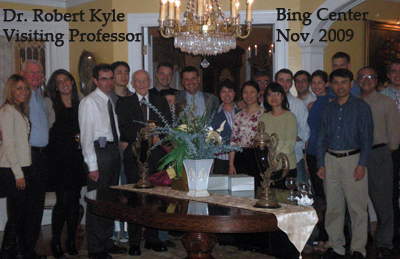 The Bing Center also made contributions to the investigation and advancement of many novel agents for the treatment of WM. The Bing Center has conducted prospective clinical trials which have examined many novel agents and combinations in WM patients including: the monoclonal antibodies rituximab and alemtuzumab; the nucleoside analogue fludarabine with rituximab; the immunomodulatory agents thalidomide, lenalidomide, and pomalidomide with rituximab; the proteasome inhibitors bortezomib and carfilzomib alone and with rituximab; and the BTK inhibitor ibrutinib. These studies enabled inclusion of rituximab, alemtuzumab, thalidomide, bortezomib, carfilzomib and ibrutinib into WM Consensus and NCCN Treatment guidelines. These studies also identified drug toxicities particular for or more pronounced in WM patients, including the IgM flare to rituximab, increased peripheral neuropathy associated with bortezomib, lenalidomide-related aggravated anemia, late immune thrombocytopenia to alemtuzumab, and secondary malignancies associated with nucleoside analogues that impacted treatment guidelines and led to trials examining alternative treatment strategies. 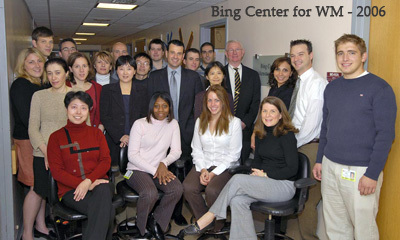 Faculty of the Bing Center have also taken a lead role in educating broad audiences including patients, caregivers, scientists, and clinicians on the genetic basis, biology and therapy of WM. The lectures and seminars on WM have includes “Meet the Professor” and educational session lectures at meetings of the American Society of Hematology (ASH), the American Society for Clinical Oncology (ASCO), and the American Association for Cancer Research, as well as International Myeloma Workshops, the International Conference on Malignant Lymphomas, and the Pan-Pacific Lymphoma Meeting. The Bing Center for WM has also published extensively on topics in WM and related disorders, with over 200 peer-reviewed original reports, authoritative reviews, editorials, and chapters included in many high-impact journals and textbooks. 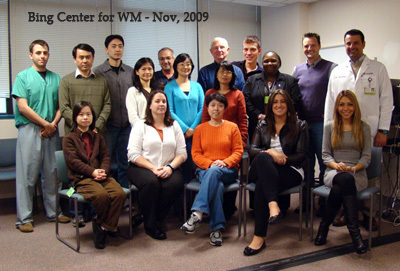 The Bing Center for WM has also been the principal organizer of the International Workshops on WM (IWWM) that constitute the main forum for the exchange of basic, translational and clinical trial advances in WM. IWWM now attracts 250 investigators from over 30 countries, and is responsible for development of published consensus guidelines for the diagnosis, management, and response assessment criteria for WM. In addition, the Bing Center has been the organizer of the WM International Patient and Physicians Summits, which bring basic science and clinical advances directly from investigators to patients, and also help investigators formulate research priorities based on patient input. The efforts on behalf of WM patients have been acknowledged by many awards to our faculty including the Robert A. Kyle Award (2005, 2016), the Jan Gosta Waldenstrom Lifetime Achievement Award (2010), the Laurie Strauss Leukemia Foundation Outstanding Cancer Investigator Award (2010), designation as “America’s Top Doctor” by U.S. News and World Report (2011), and the “One Hundred Award” (2012) from MGH. 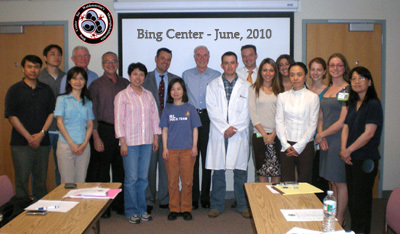 Additionally, the scientific work from the Bing Center earned “Best of ASH” designations at the 2011 and 2013 Annual Meetings of the American Society of Hematology, a Discovery Award for impactful contributions to medical oncology from the Dana Farber Cancer Institute, and the Bruce Waterfall Memorial Lecture Award from the Lymphoma and Myeloma Congress. In 2016, the International Myeloma Society selected the faculty of the Bing Center for WM, and the Lipper Center for Myeloma to organize the 17th International Myeloma Workshop (September, 2019), the largest and most prestigious congress devoted to the plasma cell malignancies with over 3,000 attendees.